I work from home, I have small children, and it is not possible to volunteer as much as I would like… but I can still make a difference through offering small acts of kindness whenever I can. The other day I was thinking about what exactly I could do right here from home, and I made this list. Send an email to a teacher, relative, or author who has inspired you. Comment on a favorite blogger’s latest post, letting them know just how they touched your heart. Donate to an online charity or, if you don’t have the funds, spread the word about an important cause on social media. Call up your parents to say “I love you” and to thank them for their support throughout the years. Send a happy text to your partner or a friend, just to cheer them up. Order flowers, groceries or a cooked dinner to be delivered to a friend in need. Share an inspiring quotation on Facebook, or send it via a message to someone who will appreciate it. Print out a favourite character – either in colour or as a colouring page – for your kids to surprise them. Write a message on it and then decorate or colour it in together. Write down five things you love about yourself and give yourself a hug. Because it’s important to be kind to yourself, too. I have enjoyed looking through the list over the past few weeks and checking them off one by one. Each act in itself is small, but if one is offered every day – imagine the influence one person can have over time. 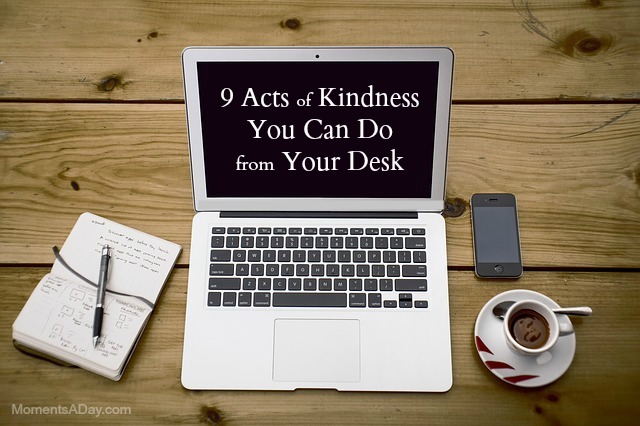 What act of kindness have you enjoyed offering right from your desk at home? I would love some more ideas – please share! Great, simple ideas! I think people forget how easily we can make a difference in someone’s life. Saying hi or giving a hug can truly life someone’s spirits. Thanks for sharing!